You heard us. While we love ramps, at this time of year — people can go a little ramp-crazy. It quickly leads to over-foraging, destruction of our precious outdoor spaces and really stinky car trunks. Stinging nettle is a large perennial plant that can grow quite tall– but tastes best early in the season. It has been used for hundreds of years to treat painful muscles and joints, eczema, arthritis, gout and even anemia. It’s got a spinach like flavour and can be subbed anywhere you’d use cooked spinach. What to look for: Foot tall, dark green leaves with sharp, stinging, tiny hairs all over. Stinging nettles have tiny, fuzzy-like white flowers. Edible Parts: Leaves, stems and roots. Try: Nettle soup, nettle pesto or our favorite, foraged borage and nettle raviolini! Maple blossoms are plentiful, especially in the city. While climbing and foraging city property is frowned upon, I’ll bet my favorite pair of scissors you’ve got a friend with a tree in their front yard. They’re sweet, crunchy and delicate. 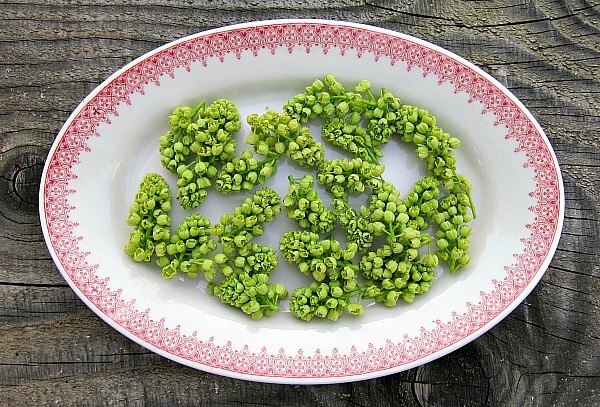 What to look for: Bright, almost florescent green flowers at the tips of maple branches. Once they fall to the ground, they can get damaged and be bitter. Stay safe and get climbing. Edible Parts: Tender stems and flowers. Try: Fritters! Dip in a sweet batter and give them a fry. Dust them with icing sugar and you’ve got yourself something amazing and uniquely Canadian. They’re also lovely pickled. Dandelions are often considered a pesky weed in Canada. Despite their poor reputation, they’re a rich source of vitamins, minerals and even antioxidants. What to look for: The dandelion has a rosette base producing several flowering stems and multiple toothy, deeply-notched, basal hairless leaves. Edible parts: Leaves, root, and flower. Try: Dandelion leaves can be added to a salad or cooked. Flowers can be juiced and the roots are often used as tea. Originally from Europe, garlic mustard is now considered an invasive species in Ontario — so eat your fill! The flower of this wild edible only appears from May to June. The plant itself has a peppery, garlic like taste and can be eaten cooked or raw. What to look for: Broad heart-shaped or kidney-shaped leaves with coarse, rounded teeth, petite white flowers, slender pods that contain the seeds — and an unmistakable garlic odour. Try: Pesto — just leave out the garlic, this herb is intense! Also, they’re great chopped onto a hot pizza. Chickweed has long been prized because it is full of vitamins, minerals and other essential nutrients. It can grow from 5 to 50 cm. tall and covers it’s patch of the earth in a lattice of stems and small leaves. It is one of the most common weeds founds in lawns but it also grows well in cultivated fields, pastures and even waste areas. What to look for: Chickweed grows intertwined and it has small white star-shaped flowers while stems have a thin line of white hair that grows in a weave-like pattern. Try: Tossing it raw into your salad. It’s delicate and slightly nutty. And remember, forage responsibly. Never eat anything you can’t identify with full confidence. Never over pick a plant. Leave enough for it to flourish for future generations.